Welcome to our new friends from Planet Gore. You might be interested in some further comments on An Inconvenient Truth such as "The lag between temperature and CO2 (Gore's got it right)" and Glaciers (Al Gore got it right), and oh yes, sea level. For those wanting more details about the IPCC sea level rise statments, and why Gore's statement are not in disagreement with the latest IPCC report we have more from someone involved in drafting the IPCC report. More references on request. But many scientists do believe that hurricane strength is affected by warmer water. Does Gore’s film go beyond that? “He shows all these things that happen naturally, ice calving off and falling into the ocean, for instance, droughts and floods—and implies that it is all related to global warming,” Spencer said. He also claimed that only two of the five scientists interviewed in Borenstein’s piece were actually climate scientists. "You cannot blame any single storm or even a single season on global warming. ... Gore's statement in the movie is that we can expect more storms like Katrina in a greenhouse-warmed world. I would agree with this," said Judith Curry. She is chairwoman of Georgia Tech's School of Earth and Atmospheric Sciences, and is co-author, with Mr. Webster, Mr. Holland and H.R. Chang, of a paper titled "Changes in Tropical Cyclones," in the Sept. 16 issue of Science, a weekly publication of the American Association for the Advancement of Science." 16. I'll go out on a limb with Bob Watson, chief scientist of the World Bank and former head of the IPCC. Senator James Inhofe is demanding that AP provide him the names of the 19 atmospheric scientists who told the press agency that the science in "An Inconvenient Truth" was accurate. I have gone through a number of articles and put together a list of the first 14 that I could find. Here is a chance for climate scientists to step up to the plate. If you agree with Jim Hansen, Robert Corell, Eric Steig, and the others listed below, put your name, some indication of your expertise and any other words you may wish into the comments. I will move them up into the text, and we will have our own little list. The only rule is that you MUST be a climate scientist, or in a closely related field and have seen the movie or read the book. "I said, 'Al, I'm absolutely blown away. There's a lot of details you could get wrong.' ... I could find no error." How well does the film handle the science? Admirably, I thought. It is remarkably up to date, with reference to some of the very latest research. Discussion of recent changes in Antarctica and Greenland are expertly laid out. He also does a very good job in talking about the relationship between sea surface temperature and hurricane intensity. As one might expect, he uses the Katrina disaster to underscore the point that climate change may have serious impacts on society, but he doesn't highlight the connection any more than is appropriate (see our post on this, here). "Such an amount of relatively hard science could have been extremely dull, and I've been to a lot of presentations on similar stuff that were very dull," says Schmidt. "Where there was solid science, he presented it solidly without going into nuts and bolts, and where there were issues that are still a matter of some debate, he was careful not to go down definitively on one side or the other." whose work on retreating glaciers from the Andes to Kilimanjaro and Tibet is featured in the film, was happy with the result. "It's so hard given the breadth of this topic to be factually correct, and make sure you don’t lose your audience," he says. "As scientists, we publish our papers in Science and Nature, but very few people read those. Here's another way to get this message out. To me, it's an excellent overview for an introductory class at a university. What are the issues and what are the possible consequences of not doing anything about those changes? To me, it has tremendous value. It will reach people that scientists will never reach." "I think that he's gone to great lengths to make the science comprehensible to the layman," he says. "Given the fact that this was a film intended to bring the message to the lay public, I think it was excellent." There are some minor things I might nitpick, but they don't detract from the overall message," said . Bob Hall -- chief of EPA's air pollution technology branch, which does research on pollutants emitted by boilers and engines -- called the film an eye-opener. Like her colleagues, Geri Dorosz, an environmental scientist, said the fact that the movie will bring the issue to a wider audience was inspiring. "He is preaching to the choir here," Dorosz said. "Now, if he could preach to some of those that are singing out of tune." 13. Richard Gammon, another UW climate change expert, said the film could be "pretty shocking" for people who are in denial about global warming and see the movie as their first exposure to the evidence. NASA and other scientific agencies around the world observed a moment of silence during his memorial service on Sunday. The tribute even extended into space, where data collection on two satellite spacecraft ceased for the moment of remembrance. One of the accidental themes of Rabett Run has been the smokescreen that a few scientists have put up to limit regulation of tobacco. Anyone paying attention knows that a rather small number of well paid scientists coordinated a campaign to provide cover for Big Tobacco. Strangely in large part they were the same people who now are out front on climate change denial. "Smoking by parents causes respiratory symptoms and slows lung growth in their children," the report added. "The scientific evidence indicates that there is no risk-free level of exposure to secondhand smoke." "Nonsmokers need protection through the restriction of smoking in public places and workplaces and by a voluntary adherence to policies at home, particularly to eliminate exposures of children,"
Phil might consider the babies whose moms and dads smoke. Eli would like to ask Seitz and Singer and their fellow travelers on a very well paid road what they intend to do to make up for the harm they have caused? Those who have contributed to the smog machine have to ask themselves the same thing. On the other hand, it would really do the heart good to see them chased down by a mob of tort seeking lawyers. Were the world just, Singer, Seitz and Co. would spend the rest of their days in jail. Eli would settle for watching them spend the rest of their days in court. A few weeks ago, in a posting on sea level rise, Eli pointed out that sea level rise lags warming by a considerable extent. This accounts for a 500 year delay between when you stop emitting CO2 and the final sea level. 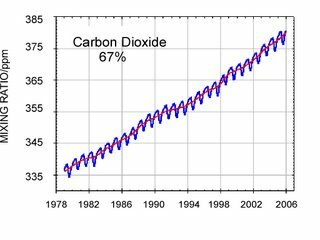 To repeat the top figure is the prediction for increasing CO2 by 1% a year for 70 years and then holding it constant, the bottom is for increasing CO2 by 1% a year for 140 years and then holding it constant. But, as was pointed out, there is a caveat to this prediction, that glaciers respond slowly to external forcings. A recent feature article in The Earth Observer, v. 18(3), p. 8, 2006 casts strong doubt on that article of fate. The authors, Leigh Stearns and Gordon Hamilton report on measurements by others on two glaciers in southeast Greenland, Kangerdlugssuaq and Helheim. The flow has speeded up greatly, the calving front has rapidly retreated, and the ice surfaces are 100 m lower. The 11-14 km/yr flow speed cannot be accounted for by internal pressure on the ice and the associated deformation. The scientists speculate that warmer summer temperatures observed in this part of Greenland are melting increasing amounts of water that is subsequently stored in surface ponds. This melt water eventually reaches the glacier bed, lubricating the ice-rock interface, leading to acceleration. Kangerdlugssuaq and Helheim glaciers are not the only glaciers in Greenland known to be undergoing recent rapid changes. Jakobshavn Isbræ, a tidewater glacier at a comparable latitude (69º N) in west Greenland accelerated 30% between 2000 and 2003 [Joughin et al., 2004] and retreated more than 3 km over the same period [Thomas et al., 2003]. The picture emerging from these observations is one in which large changes in ice dynamics can occur on short timescales of a few years. If the mechanism triggering the changes of Kangerdlugssuaq, Helheim and Jakobshavn affects other Greenland outlet glaciers, which currently show stable ice dynamics [Stearns et al., 2005], the mass balance of the ice sheet will become increasingly negative, unless balanced by an equal increase in snow accumulation, and rates of sea-level rise will increase much faster than current models predict. Update: If you have not already read Jim Hansen's article in the New York Review of Books do so. The base of his argument is the catastropic scenerio discussed in this posting. These are not the forcings, but the rate of change of the forcings. 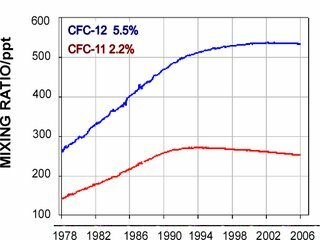 The rate of growth for CO2 forcing has clearly increased, as has the forcing itself. 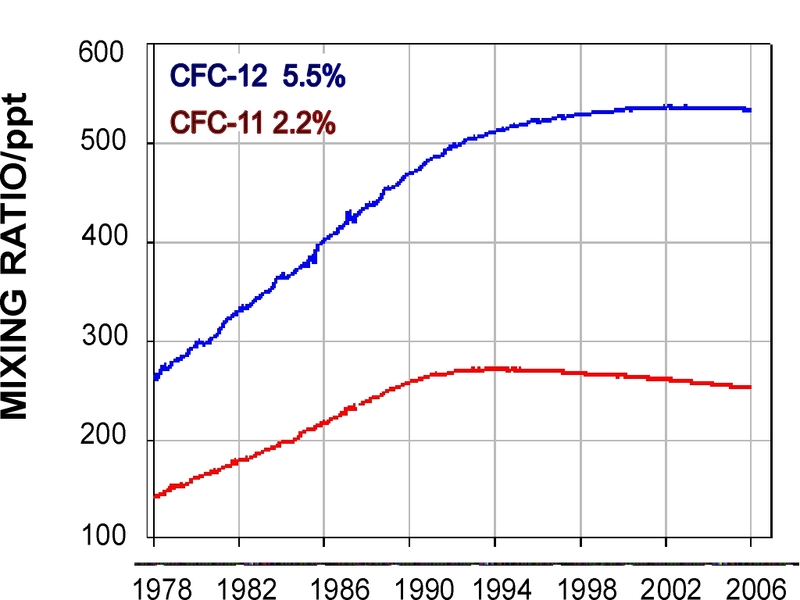 On the otherhand, it appears that the CFC forcing is actually decreasing (thanks to the Montreal Protocols). PS. You can also find the forcing for CO2 in the PNAS article CO2 F = f(c) f(co), where f(c) = 4.996 ln (c + 0.0005c2). co is the preindustrial value for the CO2 mixing ratio in ppm. From this and concentration data you can calculate changes in forcing and changes in the rates back to the year dot. Eli has not visited the place with no name, but this evening as he was sitting innocently in the garden when Ethon came by and whispered in his ear about what was going on at Pielke Jrs. blog. Roger, of course is up to his old tricks, quite in line with his blog's namesake (Wikipedia). Lieberman calls on White House and NOAA to address climate science censorship allegations 6/14/06. Providence Journal: "NOAA hiding truth about hurricanes, scientists say" 3-29-06. Rick Piltz's site is one stop shopping for those seeking to understand the game being played. Rabett Run had some even more current comments by Warren Washington, which included a pointer back to a 1989 statement by Jerry Mahlman about how Bush administrations distort science. As Steve Bloom said, nothing here, move on, just a day's work on Mount Caucasus, chewing on reality. Update: Steve Bloom points out the post was from a guest, and that Steve wanted to use something recent. I will resist the urge to say still, and buy my pet Ethon a gig of error correcting memory. On deadline for a proposal. Writers block. Mom's birthday. Nothing new until Wed.
Warren Washington, a senior scientist at the National Center for Atmospheric Research in Boulder, said that Bush appointees are suppressing information about climate change, restricting journalists' access to federal scientists and rewriting agency news releases to stress global warming uncertainties. "The news media is not getting the full story, especially from government scientists," Washington told about 160 people attending the first day of "Climate Change and the Future of the American West," a three-day conference sponsored by the University of Colorado's Natural Resources Law Center. .....Washington said in an interview that the climate cover-up is occurring at several federal agencies, including NASA, the National Oceanic and Atmospheric Administration, and the U.S. Forest Service. NOAA operates several Boulder laboratories that conduct climate and weather research. Washington's comments echoed statements made by NASA climate researcher James Hansen in a Jan. 29 article in The New York Times. Hansen said the Bush administration tried to stop him from speaking out after he called for prompt reductions in emissions of greenhouse gases linked to global warming. ......Washington insisted that government officials are "trying to confuse the public" about climate change and the scientific consensus that global warming is a real problem. Sen. Gore: Dr. Mahlman, have you ever had an experience with OMB attempting to change your presentation of scientific conclusions to the Congress? Dr. Mahlman: I have experienced a somewhat subdued version of a similar phenomenon. Dr. Mahlman: Yes. This was for testimony prepared for analogous hearing for the House Appropriations Committee on the 21st of February, and that in my organization, NOAA, the issue came down to a struggle as to whether if an individual scientist is asked to offer testimony whether he or she speaks for him or herself. And I got a lot of comments, not only from OMB, but from other people in the agency in the name of clearance of testimony that I found objectionable and also unscientific, and I pointed out to them that if I were to adhere to these recommendations that I would have an integrated testimony which would be severely embarrassing to me in the face of my scientific colleagues and that I wished to get a clarification as to whether there is clearance of testimony by people who are outside my suptervisory line or are they merely offering review of testimony which I always find valuable. I did get reviews from OMB. I did receive conclusions from them and others that should have been changed in my testimony, according to their assertion that I found unacceptable, and I said that I find this unacceptable and I insist on having the right to offer my own testimony in my own words. We in the scientific community demand the right to be wrong because if we do not have the right to be wrong, we have squelched the right to be creative. And I made it very clear that I am speaking for myself, not for my agency, nor for Commerce, nor for OMB, and that seemed to be the end of it, and effectively for this testimony I did not receive similar feedback. Sen. Gore: Were these scientists at OMB? Sen. Gore: Dr. Hansen, were there scientists in OMB who ordered the change in your testimony? Dr. Hansen: I do not know them personally, so I really cannot say. Sen Gore: These are nameless, faceless individuals with whom you are dealing, is that correct? Sen. Gore: Sort of like members of the Science Politburo of the Bush Administration. Some of America's leading climate scientists claim to Panorama that they have been censored and gagged by the administration. .....Another scientist from the National Oceanic and Atmospheric Administration (NOAA) tells Panorama he had research which established global warming could increase the intensity of hurricanes. He was due to give an interview about his work but claims he was gagged. ......Panorama learns that some scientists are afraid that what they see as a cover up will leave it too late for the US to have any hope of controlling climate changes brought about by global warming. The Washington office of the National Oceanic and Atmospheric Administration -- the agency responsible for protecting endangered salmon -- has instructed its representatives and scientists in the West to route media questions about salmon back to headquarters. Only three people in the entire agency, all of them political appointees, are now authorized to speak of salmon, according to a NOAA employee who has been silenced on the fish. The order was issued the day after an article appeared last month in The Washington Post quoting federal technocrats making positive statements about two recent decisions -- one by a federal judge, the other by federal scientists -- that challenged previous Bush administration policy about protecting salmon in the troubled Klamath River, which flows out of Oregon into California. And if you really wanted more data to show that NOAA is up to improved versions of it's old Bushite tricks, well Rick Piltz has a lot more on these activities at NOAA. Some of you might direct Rick's posts to the attention of the Captain Renault of climate blogging, who I am sure will be shocked, shocked to find that NOAA management is engaged in distorting science. We all know that Donald Kennedy, Kevin Trenberth, the IPCC, the FCCC are is the only one who do that. For the future, it is difficult to predict reliably how trace gases will continue to change. In face, it would be useful to know the climatic consequences of althernative scenerios. So we have considered three scenarios for future trace gas growth, shown on the next viewgraph. Scenerio A assumes the CO2 emissions will grow 1.5 percent per year and that CFC emissions will grow 3 percent per year. Scenerio B assumes constant future emissions. 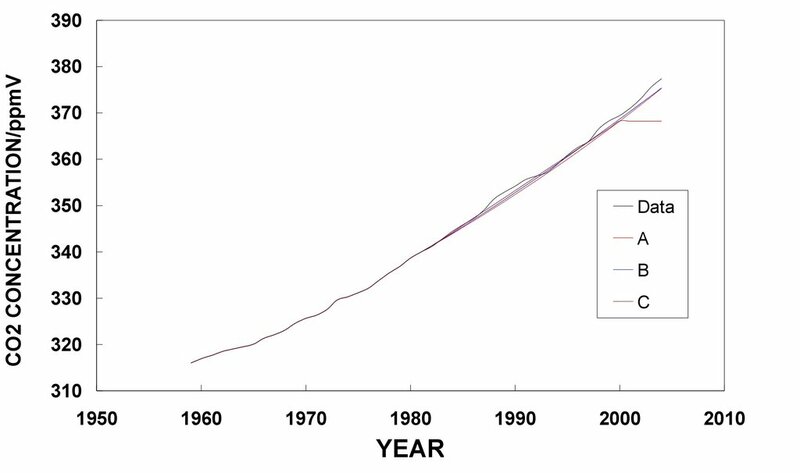 If populations increase, Scenerio B requires emissions per capita to decrease. Scenerio C has drastic cuts in emissions by the year 2000, with CFC emissions eliminated entirely and other trace gas emissions reduced to a level where they just balance their sinks. 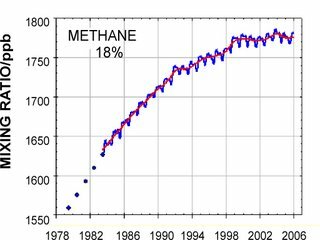 Of course, as we have seen in the previous post, atmospheric methane (CH4) concentrations have leveled off starting in 1990 and the Montreal Protocols are actually reducing the mixing ratios of the CFCs. 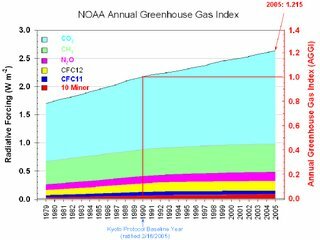 I think we could take some steps now to reduce the rate of growth of the greenhouse effect. Chlorofluorocarbons, which destroy ozone, as well as cause 20 percent of the greenhouse effect, could be phased out entirely over an appropriate period of time. The manufacturers agree that there are or will be substitutes for the chlorofluorocarbons. Also, we should increase our energy efficiency, because CO2 causes 55-60 percent of the greenhouse effect. There's a lot of room for improved efficiency. It would have other benefits, independent of the greenhouse effect, especially on our balance of payments deficit. How to get at that problem is, of course, a major difficulty and that's something you can address better than I can. I know that there are major ways that we could improve our energy efficiency. Finally, I think we should discourage deforestation and encourage reforesetation, because that would not only reduce atmospheric CO2, but also preserve the habitat for innumerable, valuable biological species. The impact of these kinds of steps on the short run is going to be relatively small, but it's very important, because it would change the direction in which the greenhouse effect is headed. Instead of the sharp, upward ramp that we're on now, it could put us on a more manageable course on the longer term, over the next several decades. Before anyone gets crazy, the "CO2 causes 55-60 percent of the greenhouse effect", clearly refers to the forcing, not the total greenhouse effect. More silly indirection from Pat Michaels, about Hansen's Scenerio A. In essence, Michaels is claiming that Scenerio A was "business as usual" and since nothing was done about greenhouse gases, it should be the reference for checking the accuracy of the 1988 GISS model. You can find links to links at Deltoid, and, of course, we have been blog, blog, blogging along over here at Updike Upper Falls. 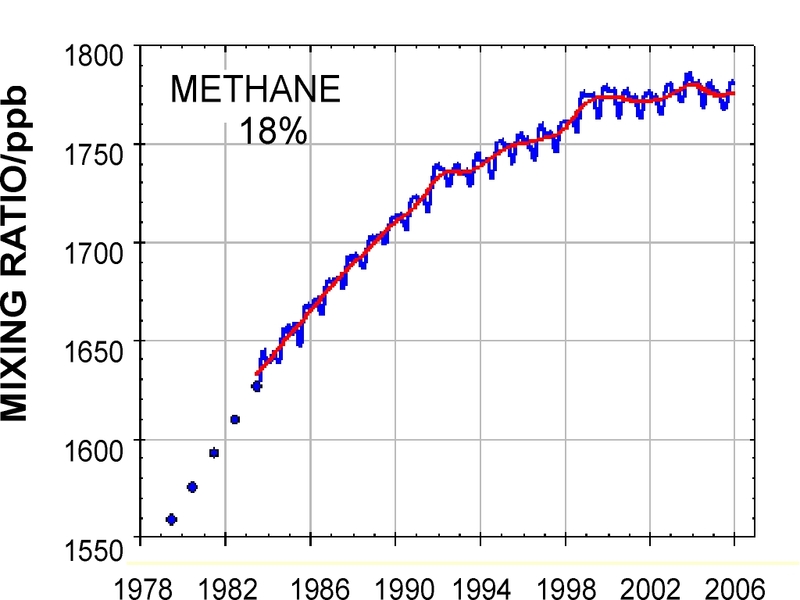 However, greenhouse gas forcing has been less than the 1988 business as usual would anticipate, principally because of a flattening of the mixing ratios for methane (CH4), and the chlorofluorocarbons. In the former case economics was the driving force, in the latter, policy as expressed in the Montreal Protocols. 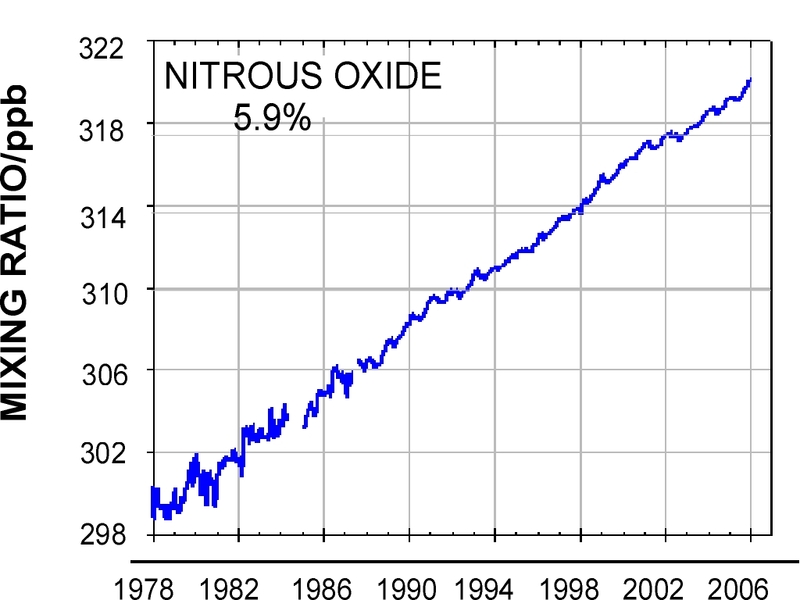 We can see this by looking at the NOAA ANNUAL GREENHOUSE GAS INDEX from which the following graphs showing the mixing ratios for CO2, CH4, N2O and the CFCs are taken. 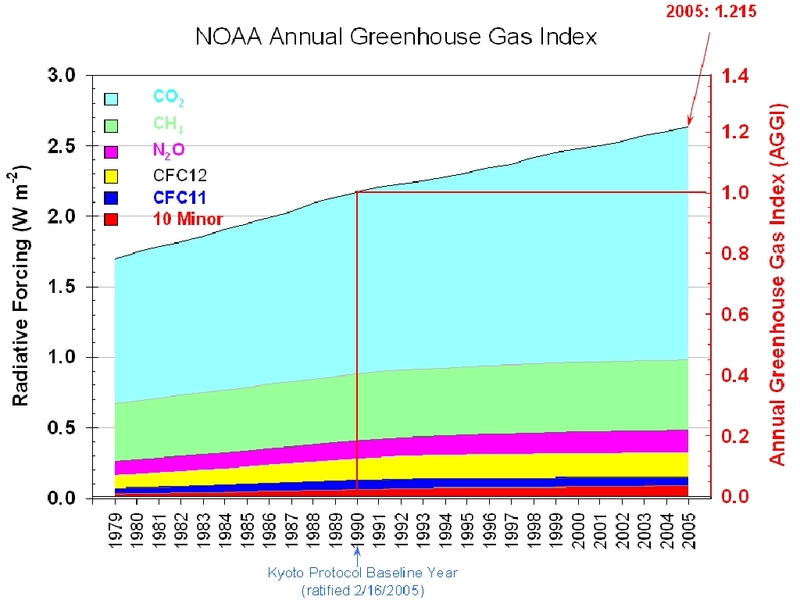 In the upper left hand corner of each graph I have put the approximate (2001) amount that each of the greenhouse gases contributes to the forcing. Business as usual would imply that the fairly linear increase in forcing up to 1988 continue. That would imply an additional ~10% forcing today. In your statement you respond to our request for information on our scientific understanding of global climate models and our effort to determine which effects are pretty well understood and which effects are subject to change as we learn more about the models. You respond by saying among other things, that as the models improve and more evidence becomes available, it is not very likely that scientists will change their conclusion that increases in greenhouse gases will intensity drought in the middle and low latitude land areas like the Midwest of the United States. I am puzzled that you also say on that same point on page 4 of your statement that you want to stress that you do not really believe that and that as the computer models evolve, that conclusion will very likely evolve and should not be regarded as reliable. I think I know the answer to the question I am about to ask you, but why do you directly contradict yourself in the testimony you are giving about this scientific question? Dr. Hansen: Let me first rephrase exactly what we said in that regard because when I discussed this with my scientific colleagues the slight rephrasing makes a difference. What I said was we believe it is very unlikely that this overall conclusion drought intensification at most middle and low latitude land areas if greenhouse gases increase rapidly, will be modified by improved models. Now, that is what I believe and it is what I wrote. The last paragraph in that section which seems to be in contradiction to that was not a paragraph which I wrote. It was added to my testimony in the process of review by OMB, and I did object to the addition of that paragraph because in essence it says that I believe that all the scientific conclusions that I just discussed are not reliable, and I certainly do not agree with that. Senator Gore: Now we are confronted with the most difficult environmental question humankind has ever faced and we are forced out of necessity to fashion policy on the basis of science that is incomplete and as we gain more information, we find more justification for toughening the actions. There is lots more to come :). BTW, that's three links to follow in the title line. Update: Coby Beck asks what OMB is in the comments. It is the Office of Management and Budget, through which the US president manages the US government. and together we say forcings. I see that even I have been caught up in confusing emissions and concentrations in the various scenerios described by Hansen et al. To clear this up, Hansen et al., made a forecast of what the mixing ratios would be for CO2 and methane. They did not predict emissions. 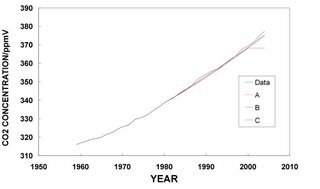 They predicted emissions for the CFCs. Building on previous work of Weiss (J. Geophys. Res. 86 (1981) 7185, they predicted emission scenerios for N2O, although this is somewhat hidden in the description. However, the real point of all this is that it is possible to produce simple, accurate predictions of future forcing over a 15 year period, and perhaps longer. On the other hand emission scenerios are easier to link to social and economic policy decisions. 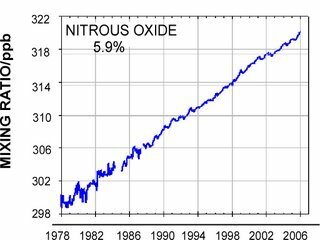 It looks increasingly like Scenerio C from Hansen et al, is a much the best match (except for CO2 after 2000) to the actual greenhouse gas mixing ratios up till now. If you look at the prediction, there is not much difference between those for Scenerios B and C. The bottom line is that anyone who says Scenerio A is the best match is blowing smoke. 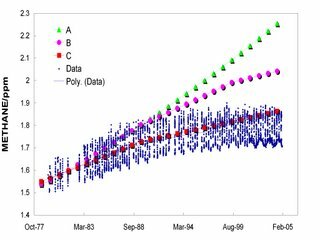 Finding a consistent set of data for all of the non-CO2 greenhouse gases is proving to be a problem. Hopefully graphs tomorrow. Now comes Paul Krugman, who as part of a column on the mendicity of the global warming denialists (Swift Boating the Planet), flat out calls Michaels a fraud, and takes Hansen to task for being unwilling to do so. Even now, Dr. Hansen seems reluctant to say the obvious. "Is this treading close to scientific fraud?" he recently asked about Dr. Michaels's smear. The answer is no: it isn't "treading close," it's fraud pure and simple. This, of couse, sets the cat among the canaries. Michaels posting from the Climate Change Denial Center of the world replied that he was sorely wounded, and then sets us off on a wild goose chase, commiting a second fraud. NASA scientist James Hansen had a model that did just this, published in 1988, and referred to in his June 23, 1988 Senate testimony as a “Business as Usual” (BAU) scenario. BAU generally assumes no significant legislation and no major technological changes. It’s pretty safe to say that this was what happened in the succeeding ten years. 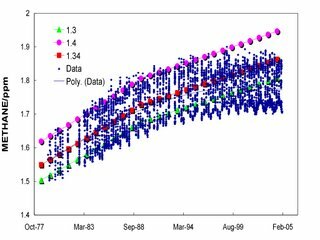 The BAU scenario produced a whopping surface temperature rise of 0.45 degrees Celsius in the short period from 1988 through 1997, the last year for which there was annual data published by the United Nations’ Intergovernmental Panel on Climate Change at the time of my testimony. The observed rise was 0.11 degrees. I cited the reasons for this. In fact, the rate of carbon dioxide increase in the atmosphere was quite constant–rather than itself increasing like compound interest–during the period. The reason this is a fraud, is that there is very little difference up to 2004 in CO2 mixing ratios for Senerios A and B (and C tracks right along until 2000 when it goes flat). 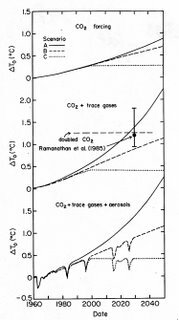 The graph below shows the data (Mauna Loa), and the predictions of Hansen's Scenerios A, B and C for CO2 concentrations. Moreover, the assumptions of Hansen, et al. 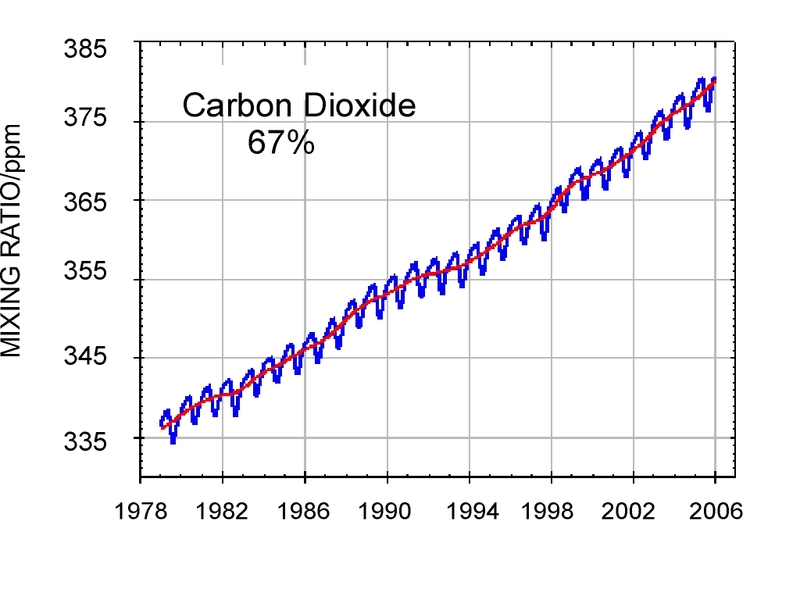 for the growth of CO2 concentrations was very good (both Scenerios A and B are about 2 ppm lower than measured in 2004). 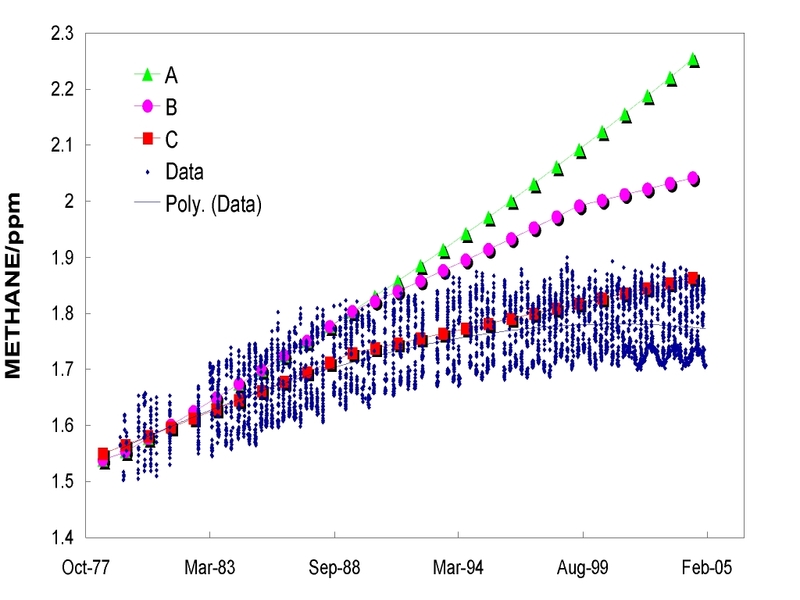 OTOH, we are now only about 18 years from the publication of the Hansen paper. Until 2010, the difference in forcing between Hansens scenerios A and B all come from changes in concentration of chlorofluorocarbons, methane, and nitrous oxide and volcanic eruptions. You can see this in Fig. 2 from the paper. 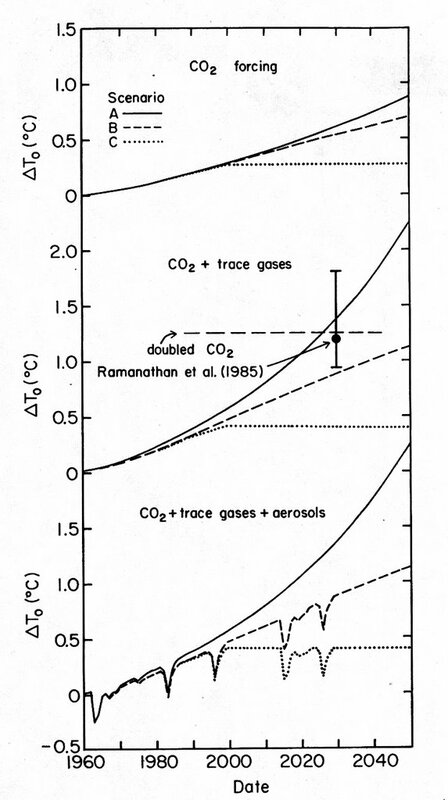 That figure shows (copy below) forcings from CO2 increases (top), CO2 + trace gases (middle) and CO2 + trace gases + aerosols from volcanos (bottom). 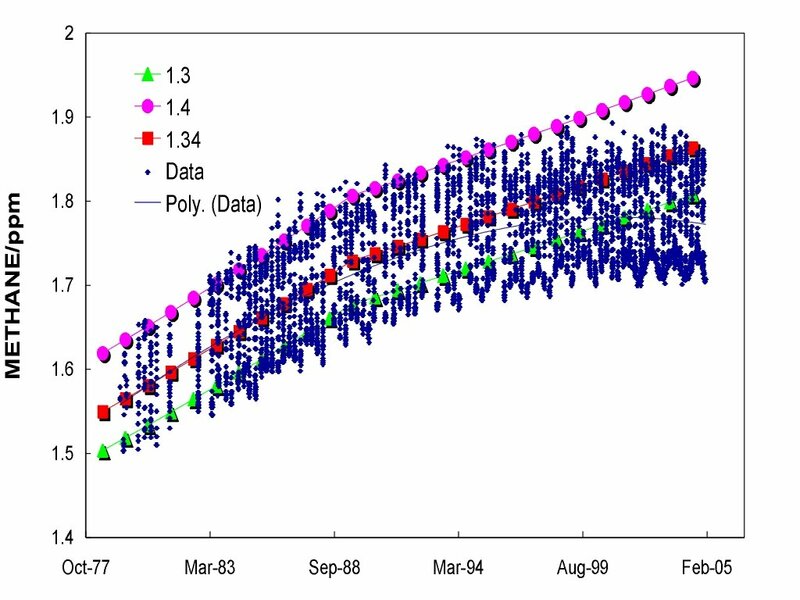 The dip in the bottom third near ~1982 represents the effect of the eruption of El Chichon, the later dips are guesses about when major eruptions will occur. Pinatubo came at in the 90s, a bit earlier than assumed, but the depth of the effect was about right. So now the question is, how well did Scenerios A, B and C match the actual growth of concentrations of the other greenhouse gases and how well did the observed forcing match that assumed in each Scenerio. Unfortunately that means I have to find the observational data. Hints are allowed. P.S. I see from Michaels post that RPJ has jumped the Hansen shark again. Well Roger, if you happen to peek in you can see that Hansen, Fung, Lacis, Rind, Lebedeff, Ruedy and Russell nailed the CO2 concentrations and the forcing from it. Update: The emission scenerios for methane (CH4) are now posted.